This ten-armed image of Krishna is an unusual depiction of the god. The wheel and the conch shell in his rear set of hands identify him as an incarnation of Vishnu. His two front hands are positioned as if holding a flute, a common portrayal of a young Krishna. However, the additional sets of arms are not often seen in images made during the reign of the Cholas. It is likely that this figure was made during the reign of the Chola rulers’ successors in Tamil Nadu, the Vijayanagara monarchs. 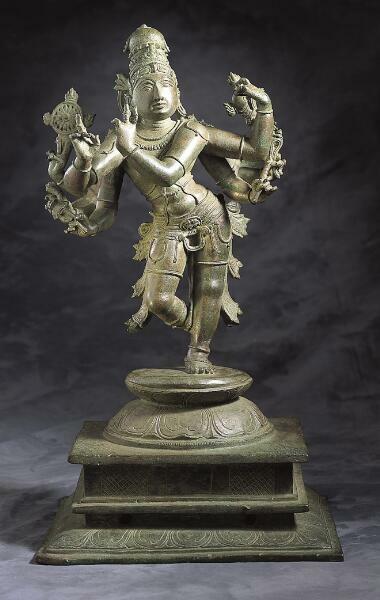 Balanced on one leg, this fascinating ten-armed figure depicts a complex form of the Hindu god Krishna. The objects in the hands tell us that the image combines three different forms: the romantic Krishna playing the flute, the preserver god Vishnu, and Rama, the divine hero of the epic Ramayana. Such a composite god is rare but logical—for Krishna and Rama are the two most popular incarnations of Vishnu. Take a moment to examine the objects the composite figure holds. His front two hands once held a flute, representing Krishna the cowherd boy. At the left, his lower second hand grasps a lotus, while the hand on the right is raised high, as if holding a bow—a weapon usually associated with the heroic Rama. The third pair of hands holds a closed lotus and a small stick. The stick may represent a truncated version of Vishnu’s club—or the shepherd’s crook. The fourth pair holds a broken object on the left side and a noose on the right. At the far back, we find hands with a wheel and conch, the typical attributes of Vishnu.